The great thing about this is that it’s reminded me what a huge part of my life Queen were as a young teenager. Of course I watched their incredible Live Aid performance like everyone else – in fact, we watched it so many times during the school lunch-hours that the VHS tape started to wear out ! But we were all huge Queen fans long before then – “Sheer Heart Attack” was the third album I ever taped to listen to on my treasured Aiwa personal cassette player, and is still probably my favourite. (What were the others ? I’d rather not say. What’s interesting with hindsight was that I didn’t think much about how the songs were recorded at the time, even though I was already deeply interested in recording an audio technology. So I just took a studio masterpiece like “Bohemian Rhapsody” for granted. Not any more, though ! And to help fill in the blanks, the first piece of YouTube footage I found was the footage above of Brian May listening to the original takes of “Bohemian Rhapsody” in 2002. And perhaps the most amazing thing about it is simply to realise that Freddie had the whole thing in his head, from the outset – choir section and all. So, there you go – several hours of high-quality Queen-in-the-studio-related footage – I hope you find them as fascinating and inspiring as I do ! 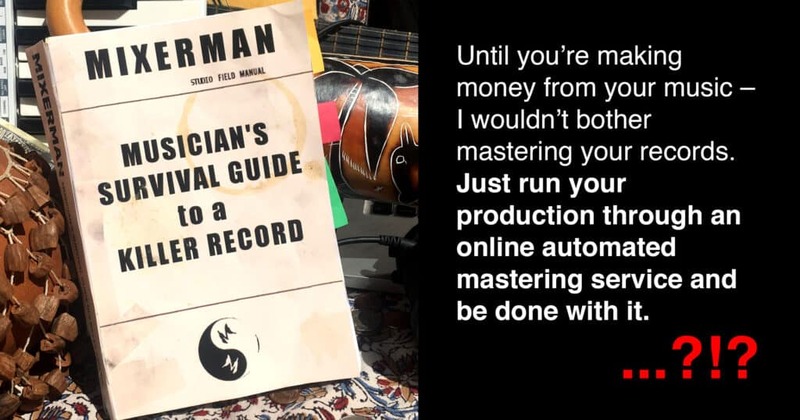 So first, all the quotes here are taken from a blog post which you can read here, and are parts of an excerpt from Mixerman’s newest book, the Musician’s Survival Guide to a Killer Record. I agree with the last sentence, but not the rest of it ! As a mastering engineer I’m absolutely focused on making sure the emotion of the song, performance and mix are conveyed to the listener with the maximum possible impact. The tools are more limited in mastering than in mixing, but the goal is the same, and the impact can sometimes be fundamental. Talk about poor paraphrasing – Eric seems to be saying that because mastering engineers care about Sound, they somehow don’t know or care about music. Last time I checked music was conveyed by sound, and the way we hear it is utterly influenced by the way it sounds ! “Abbey Road” is a great album on any format, no matter how lo-fi, but if you really want to feel the pulse of “Come Together” or get chills from the end of “The End”, you need to be listening in full-frequency stereo, it needs to sound great – and mastering has a crucial role to play in that. Music is about emotion, yes – but it’s about emotion communicated via sound, and to suggest that the two aren’t intimately connected makes no sense to me – it’s a false distinction. So at the very least Eric is being inconsistent about his message – if he truly understands and appreciates the impact of mastering, why does he spend so much time minimising it’s value ? Now actually there are two points being made here, and one of them I don’t entirely disagree with. Eric’s whole argument is that you need a great mix before you can make a great master, and I agree with that. If you’re not able to get a great mix yourself, or to pay someone to make one for you, paying for mastering really doesn’t make much sense. But the solution is NOT to use an automated mastering service – the idea of using a decent limiter is actually probably better ! The real problem is that whereas a good limiter will simply lift the level without dramatically changing the mix, automated mastering services do far more than that. They use “AI” and sophisticated processing to try and emulate what a real engineer might do. Which is fine – sometimes it works really well, and sometimes it doesn’t. But just like a real mastering engineer, you’re much more likely to get a great result if the mix sounded really good going in. If it doesn’t, with a mastering engineer (or limiter !) you usually just get a not-so-great master back. But with an automated service, you typically get back a train wreck, in my experience. So Eric’s logic is completely backward ! If you don’t have a great mix to begin with, you really shouldn’t use automated mastering, because it’s far less likely to work well – a simple limiter, used carefully, is probably a much better option. Especially because automated mastering services are “black boxes”. We have no idea what happens in between sending the file and getting the “master” back – and often the default settings are much too aggressive, especially in terms of loudness. So let’s get back to that first quote, that Eric uses to sum up his section on mastering. I said he’s wrong about that, but how do I know ? Because I have over 20 years of experience mastering countless projects that people have mixed themselves. Some of them have been stunning, some of them have been less so – but all of them have been improved by the mastering work I’ve done for them. Otherwise I wouldn’t feel comfortable charging people for them. All of them have sounded dramatically better than they would have by simply lifting the level a few dBs into a limiter – and yes, they have more emotional impact as a result. Would they have sounded even better if they’d also been mixed by a professional mixer ? Maybe. In some cases definitely yes, but in some cases certainly no ! I’ve heard some outstanding amateur mixes over the years, and some truly dreadful professional mixes, too. There’s no question that there’s far more potential to make or break a song at the mixing stage than during the mastering – but if your mix is already good, there’s no guarantee that a pro mixer will be able to realise that potential better than you. And it’ll certainly be much more expensive – mixing typically costs 5 to 10x more than mastering at a similar level of expertise. Eric himself makes this same point but about mastering engineers – how are you supposed to find a good one ? Well exactly the same challenge applies to finding a great mixer – and the same solutions. Listen to people’s work, ask for recommendations and start a conversation with an engineer you’re interested in working with. Or don’t ! Make the best mix you can, apply some gentle limiting and check how it sounds at www.loudnesspenalty.com. But whatever you do, DON’T just send it to a machine and hope for the best. Mixerman, you should know better. I mention in the post that I haven’t read the whole book, and Eric has raised this in our conversations on Facebook. A major theme of the book is that with proper arrangement and recording, mixing and mastering become far less important for musicians just starting out – and I agree. If you’re not making money from your music yet and have limited resources, it probably doesn’t make sense to pay for mastering (or mixing). But that includes auto-mastering ! No mastering is better than bad mastering every time, and in my experience auto-mastering is often bad. Mainly because it’s a much more conservative number than many people would expect. I’ve been mastering with peak levels no higher than -1 dBTP for years now, and recommending people do the same, but I still see people saying that True Peaks aren’t an issue “in the real world”. And Spotify’s guideline is even more conservative than mine. The reason for the recommendation is simple – Spotify doesn’t stream lossless audio. They encode using Ogg/Vorbis and AAC data-compression methods to reduce bandwidth – like more sophisticated versions of mp3 encoding. These encoded streams sound pretty good, but reduce the file size by as much as ten times to reduce the amount of data needed get the audio from Spotify’s servers to our mobile phones and other playback devices. There’s no such thing as a free lunch, though – to achieve this reduction in data-rate, the audio has to be heavily processed when it’s encoded. VERY roughly speaking, the audio is split up into many different frequency bands. The encoder analyses these and prioritises the ones that contribute most to the way we percieve the sound, and throws away the ones we’re least likely to hear. When the audio is decoded for playback later, the signal is rebuilt, and usually sounds remarkably similar to the original, despite all the discarded data. However even though it sounds pretty close to the original, the audio waveform has typically changed dramatically – and one of the most noticeable differences is that the peak level will have increased. And this is where the problem arises. If the audio was already peaking near 0 dBFS, the reconstructed waveform will almost certainly contain peaks that are above zero. And that means that the encoded file could cause clipping distortion when it’s reduced to a fixed bit-depth for playback, which wasn’t present in the original. In fact, it’s even worse than that, sometimes. Encoded files store the data with “scale factor information” built in (kind of like a coarse floating point), but many players reduce the decoded files to fixed-point immediately after decoding. So whereas extra decoding peaks aren’t an issue if the signal is turned down before it gets played back, clipping during the decoding process will be “baked in” to the decoded audio in this case, regardless of normalization or the final playback level. What does all this have to do with True Peaks ? There’s no way to know for sure if encoding will cause clipping, or how much – it depends heavily on the codec, the material and the data-rate, to begin with. Lower data rates require heavier processing, and cause bigger changes in peak level, and can potentially cause more encoder clipping. The True Peak level gives a useful warning, though. It was introduced as part of the R128 Loudness Unit specification, and gives a reasonable indication of when encoder clipping is likely to occur. Really loud modern masters can easily register True Peaks levels of +1 or +2 dBTP, and often as much as +3 or +4 ! Those files are virtually guaranteed to cause encoder clipping if they’re processed as-is, so to avoid the risk of encoder clipping, it’s sensible to reduce the level of those files before you supply them, to get the best quality encodes. The question is, how much should they be reduced ? It’s impossible to say exactly without trying it. The harder the audio is hitting the limiter, and the lower the data rate, the bigger the changes in peak level during encoding and decoding will be, and the more likelihood of problems as a result, so there’s no one-size fits all solution. Personally I don’t make super-loud masters, and have found that my suggestion of -1 dBTP typically produces very clean encodes, but we have to assume that Spotify’s recommendation is based on analysis of the files they encode. I’ve double checked some of my own recent masters, and found that using my own loudness guidelines I’m getting clean encodes, so I won’t be changing how I work because of this recommendation. But certainly if you’re making mixes or masters that are hitting close to 0 dBFS, you should be thinking of starting to measure True Peaks and reduce the levels to avoid them, at the very least. But the music is MEANT to be loud, why should we turn it down ?! Well firstly because the encodes could sound better if you do. But also because it’s going to be turned down eventually, anyway ! Spotify uses loudness normalization by default, just like YouTube, TIDAL and Pandora. This means they measure the loudness of all the material they stream, and turn the loudest stuff down. This is done to stop users being “blasted” by unexpected changes in level, which is a major source of complaints. And even if users turn normalization off, they’re unlikely to run the software with the volume at maximum ! So even if you’re in love with the super-dense sound of your music, reducing the overall level when you submit it won’t have any practical consequences for the final playback level – it can only sound better because of a cleaner encode. What about -14 LUFS ? I’ve had a few people asking about the fact that Spotify’s normalization reference level is approximately -14 LUFS, and if this -2 dB True Peak recommendation over-rules or replaces it. The answer is No – these are two separate issues. The -14 LUFS figure simply gives us an idea of how loud Spotify will try and play songs in shuffle mode – it’s never been a “target” or a recommendation. This is a common source of confusion, and I wrote about it in more detail here. The -2 dBTP recommendation is to try and ensure better encoding quality for material that was mastered very loud originally – peak levels aren’t a good way to judge loudness. So to get the best results you should keep both numbers in mind. I’ve said it before, and I’ll say it again – the loudness normalization reference levels aren’t meant to be targets. Instead, master your music so it sounds great to you, and preview it using the free Loudness Penalty site to see how it will sound when normalized. But you should also be aware that very high peak levels can cause sub-standard encodes when the files are converted for streaming. And if you’re like me, you’ll want to do everything you can to get the best possible results – including keeping an eye on the True Peaks. I’m seeing a lot of different reactions to the information in this post. They vary from “yes I’ve been saying this for ages”, through annoyance that there’s yet another number to think about, all the way to “ah I don’t care, I’ll just turn the limiter output down a little”. Be very careful about this last option. The harder you push the loudness into a limiter, the higher the True Peak level will go. And the higher the True Peak levels are, the greater the risk of encoder clipping. So you’re fighting a losing battle. Remember True Peak doesn’t necessarily predict how much clipping will take place, so if you try to upload at the same loudness and just reduce the True Peaks, you could end up with just as many issues with the encode. Wavelab, Ozone, Sonnox and others offer “codec preview” features which allow you to assess the results of encoding – if you’re chasing extreme loudness then you need to use methods like these to check the results you’re getting. And as always personally I think the best answer is a perfect balance between the different factors – between loudness and dynamics, and now between loudness and True Peak values. If you want to know the method I use myself to find the perfect loudness when I’m mastering, and why it works – click here. What is really valuable is to use the new Loudness Preview function to compare the song you’re working on with reference tracks on YouTube itself. Provided you have the volume slider all the way up, you’ll be making a real-world comparison between the reference and your song, almost exactly as it will sound if you actually uploaded it. This is where the real power of the site comes into play. Say you’re under pressure from a client to master something louder than you think it needs to be. 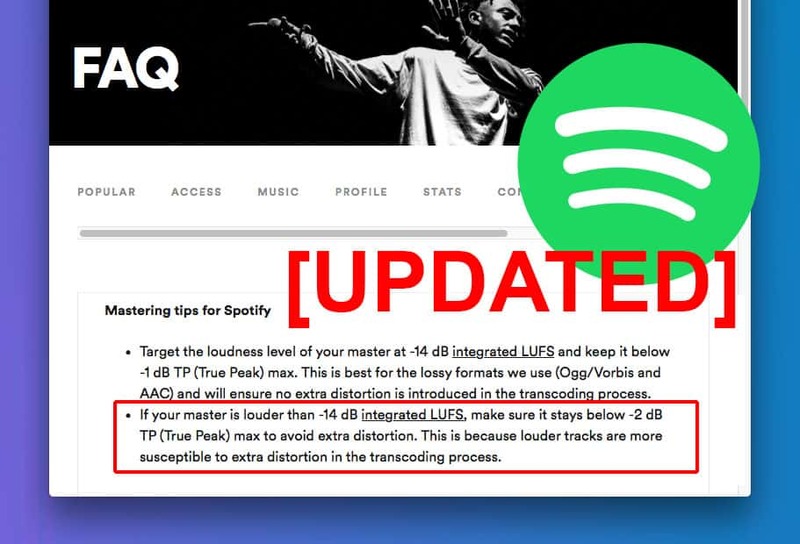 If you make two versions of the master – one at the louder level and one at your preferred level, you can send both versions to the client and ask them to Preview them using Loudness Penalty. You can even open both versions at the same time in different tabs of your browser. The louder version sounds worse Sometimes this is subtle, sometimes it really isn’t. Sometimes the less heavily processed version actually sounds louder ! And even if it doesn’t , chances are it will sound more 3D, more open, more spacious – clearer, wider and sweeter. And that’s why we’re so excited – because this idea is so easy to share. When it was all just numbers, people had to really take the time to understand what was happening, and why it mattered for their music. Now they can hear it for themselves ! And make informed choices about loudness. My hope it that eventually the Loudness Penalty site becomes the new standard way to compare new mixes and masters – and if it does, perhaps people will start to hear that louder actually doesn’t sound better, online – and start choosing more balanced dynamics for their music as a result. If you like the idea too, please share it and help spread the word ! I recently did an interview with Chris Selim over at mixdown.online, and my analogy of the ‘Loudness Cliff’ came up again, with me waving my hands around while describing it as usual. But this time something was different – because a few days later Kredenz emailed me an idea for the image above, asking “is this the kind of thing you had in mind?”. And it absolutely was ! So after a few tweaks and additions, here it is – The Loudness Cliff illustration. We perceive louder sounds better, at least to begin with. So, everyone wants to sound loud – so far so good. But achieving loudness can be difficult – sometimes it feels like you’re trying to push a rock up a hill. Everyone else is at the top of their own mountain though, so you want to be, too. The trouble is, the closer you get to the top, the harder it gets, and the less improvement in sound you get. And if you go too far – past the danger point – it can actually sound worse. And if you push it even further – you’re over the edge and smashed on the rocks. Instead, you want to look for the ‘loudness sweet spot’ – the perfect balance of loudness and dynamics, where you get all the benefits of cohesion, consistency and translation – without pushing things too far. The goal is to be loud enough, but not too loud. 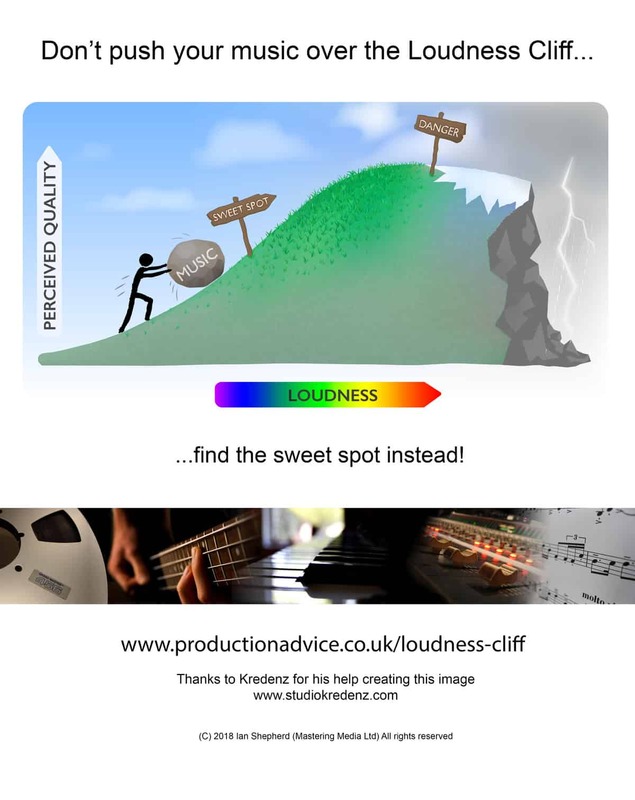 So, enough of the analogies – how do you actually find the loudness ‘sweet spot’ ? If your music scores between 0 and -2 for YouTube, you’re probably in good shape! And if not, there’s plenty of free information here on Production Advice to help you – a great place to start is here. 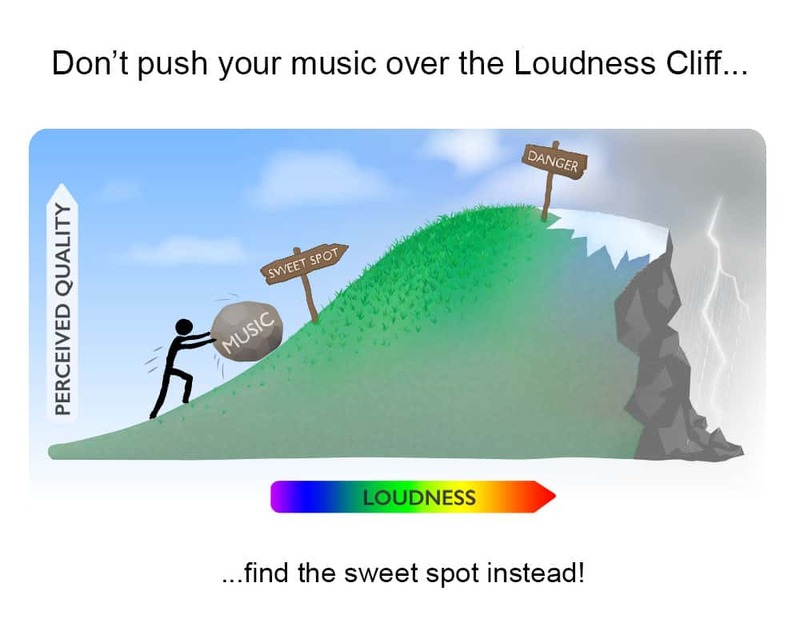 Don’t push your music over the Loudness Cliff – find the loudness Sweet Spot instead ! Thanks again to Kredenz for making my hand-waving idea a reality ! You can check out his site here. And the numbers are accurate – if you run a loudness meter on Spotify for 30 minutes or more, you will find the overall playback loudness is very close to -14 LUFS, especially for loud material. But that’s an average value – individual songs may vary up or down by several dB, because ReplayGain gives different results to LUFS. The same applies to YouTube, iTunes and Pandora. 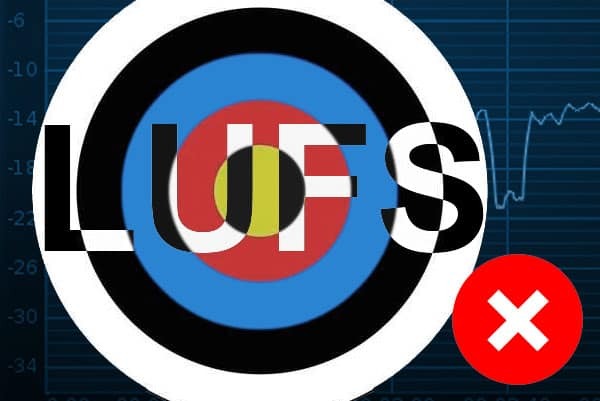 So using LUFS as a target just won’t work reliably – as well as being a bad idea. What do you mean, a bad idea ? Why NOT target loudness at specific services ? Because we don’t need to. Streaming services measure the loudness and make it more consistent for us – so we don’t have to. Loudness normalization is an opportunity to do what’s best for the music, without having to worry about the need to “fit in” with loudness. Having said that, there can be an advantage to keeping the streaming services’ playback levels in mind while you’re optimizing the loudness of your music – which is why we created the Loudness Penalty website. Let me explain. Imagine you master a song, and test it using the Loudness Penalty site, which tells you it’ll be turned down by 6 dB or more on all the streaming services. That means you could potentially apply 6 dB less dynamic processing and still have it play back just as loud. I don’t know about you, but that feels like an opportunity to me ! At the very least I’d want to experiment as see how a less heavily processed version sounded, using the LP scores to hear how it will sound online. In the most agressive genres, it might be that you decide to stick with the original version, but in my experience this rarely gives the best results. For me, the sweet spot for loud material is about LP -2 on YouTube – but you may feel differently. Either way, don’t we owe it to the music to at least try the experiment ? So, what am I actually saying ? On the one hand, there’s no point in trying to optimise loudness for streaming services, but on the other there might be an opportunity. I’m contradicting myself, surely ? It’s true that there’s no real benefit to supplying separate loudness-optimized masters for each streaming service – partly for the reasons explained above. But also in a practical sense, because most agregators will only accept one file per song anyway, so there’s no easy way to get individual masters uploaded to each service. But there is a benefit to optimising your music for online streaming in general. Measure your files using the Loudness Penalty site, and find out how much they’re going to be turned down. Experiment with less agressive loudness processing, and preview the different versions against each other – and your favourite reference material – using the LP scores to adjust the playback level and see how they’ll sound online. Knowledge is power – and making real-world comparisons like this will let you find the “sweet spot” – the perfect balance of loudness and dynamics, that best serves the music. Not the streaming normalisation algorithms, or the wild ‘Loudness War’ goose – the music. And in the process, even if you think your genre needs that loudness war sound, you might find yourself surprised. If J Cole can break streaming records and debut at Number 1 in the Billboard chart with a more dynamic master – maybe you can, too. I’ve been getting quite a few frustrated comments about this, saying “well how loud should we master things, then ?!”. If that includes you, click here for my best advice.